LYNDON—An Osage County District Court judge has denied James Kraig Kahler’s request for the state to appoint and pay for attorneys to conclude his capital murder case. On Aug. 25, an Osage County jury convicted Kahler, 48, of capital murder, four counts of first-degree murder and aggravated burglary, for killing his wife, Karen Kahler, 44, his daughters, Emily, 18, and Lauren, 16, and Karen’s grandmother, Dorothy Wight, 89, in Wight’s Burlingame home on Nov. 28, 2009. Afterward, the same jury recommended the death penalty for Kahler. Osage County Chief Judge Phillip Fromme set sentencing for 10 a.m. Oct. 11. In Kahler’s motion, filed the day after the jury delivered the death sentence verdict, he petitioned the court to appoint his defense team to represent him in all future court proceedings, saying the trial and a trust fund established for his son, Sean, 11, had exhausted all of his available assets. The motion says all of Kraig Kahler’s available retirement income, $2,200 per month, from his former job in Weatherford, Texas, is assigned to Sean’s trust fund. In court Monday at Lyndon, Kahler wore orange jail coveralls, orange socks and slippers, in contrast to his appearance during the trial in a business suit. 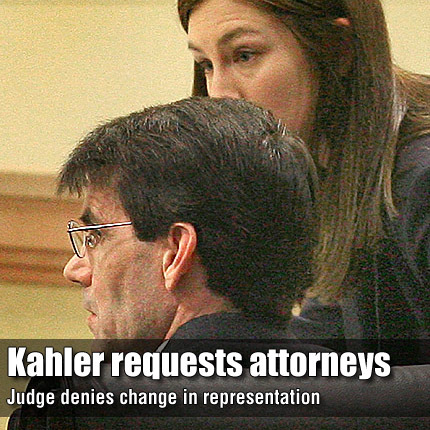 His defense team, Thomas Haney and Amanda Vogelsberg, appeared with him, with Haney saying his law firm could no longer represent Kahler without being paid. Haney said the defense team had already worked pro bono, or provided legal services for free, for part of Kahler’s trial.